WHAT IS A SKIN SERUM? With their ability to deliver essential nutrients and address very specific skin concerns, serums are rapidly growing in popularity. Usually a thin, liquid like substance, serums are designed to penetrate deeply into the skin to help provide essential nutrients. WHAT IS THE DIFFERENCE BETWEEN A SERUM & A MOISTURIZER? While a serum can help hydrate, its primary focus isn’t necessarily moisturization. Serums are designed to add nutrients to the skin deeper than surface level. Another difference is the size of the molecules in a serum, which are much smaller than the molecules of a moisturizer. These smaller molecules can penetrate into the skin while moisturizers tend to stay on the top layers. WHAT ARE THE BENEFITS OF A SERUM? Using a serum can be instrumental for radiant-looking skin. Serums can help brighten, tighten, reduce appearance of age spots, and soothe irritation and inflammation. Those who use serums can usually see an immediate difference in the texture and tone of their skin. WHEN SHOULD I APPLY A SERUM? Serums should be applied to a clean face preferably after toning. Most serums work best when applied daily in the morning or evening. 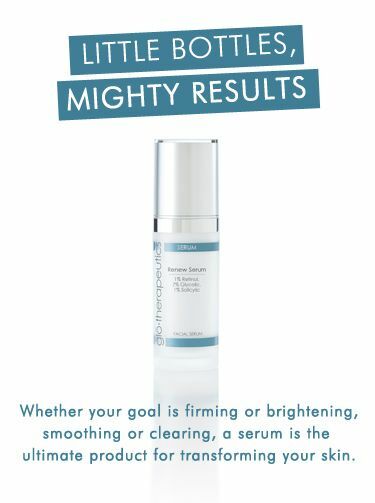 Be sure to check the directions and perform a spot test before applying a serum. WHICH SERUM SHOULD I CHOOSE? The serum you choose should depend on your skin type and the skin conditions you would like to improve. glo therapeutics carries many amazing serums that help with a variety of issues.